A personal thank you gift from us for joining Attitudinal Healing International and being a part of this work as it continues to be adapted and spread around the world. We look forward to sharing this exciting journey with you as it unfolds in the years to come. 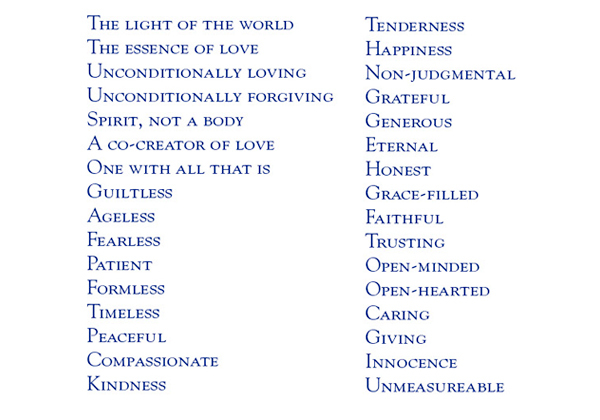 Click here to download a framable pdf version of the "TO BE" List. We have discovered that starting our day with our “to be” list instead of our “to do” list brings us a sense of peace and happiness far beyond anything we have previously experienced. It is a profound way of celebrating our “being,” the essence of love that is our true identity and our true natural state of happiness. Doing this each morning has changed our state of mind far beyond anything we have ever experienced. Our “to be” list serves to reminds us of our core self which is so often hidden from our daily awareness by the bus-i-ness of our daily doings and thoughts. It helps to remind us of our “spiritual self,” rather than our “doing self” as we bring forth the essence of our being as the Love that we truly are. This daily reminder emphasizes that we are more than just our physical bodies and that the Love we give and receive is lasting and, literally, affects the world around us. We say the list out loud and it has a deeper effect than just reading or thinking the words. We always begin with the commitment that “today is going to be the best and happiest day of my life.” No matter what happens this day, the following thoughts on consciousness enable us to learn and grow from every situation without exception. We appreciate your feedback on our new and evolving newsletter. Your comments are important to us! Please be assured your email information is secure with us and will never be shared.